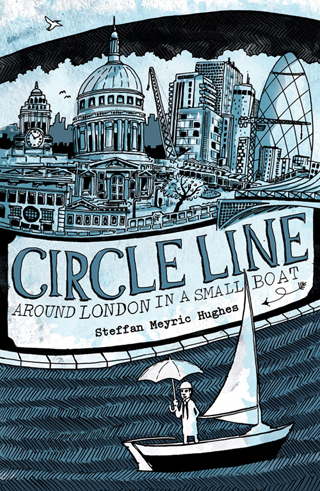 Circle Line, Around London in a Small Boat describes the adventures of Steffan Meyric Hughes as he sails and rows around central London in a small sailing dingy. Steffan is a Londoner who grew up on the water, learning to kayak at Westminster Boating Basin and surfing the outlet waves of the now silent Lots Road Power Station in Chelsea. In one chapter he leaves the dingy behind and takes his kayak on an exploration of south London’s Wandle river – an urban gem that starts as green and leafy before disappearing into the chill darkness beneath Southside Shopping Centre. His route takes him from Surbiton and along the Thames, then onto the lower reaches of the River Brent, the Grand Union Canal, the Regents Canal, along the Islington canal tunnel and back onto the river via Limehouse Dock. He visits the Thames Barrier before returning west along the Thames, taking ten days in his circumnavigation of a large part of the city. The book is full of interesting facts and detail, such as the 1,100 listed wrecks which lie on the bottom of the river and estuary, hidden by the murky Thames. The same dark waters also hide a wide variety of fish, as a glimpse at a sonar detector soon reveals. Steffan describes the industry that used to line the capital’s waterways, and sprinkles the text with fascinating titbits of maritime history. As the author slowly makes his way around the capital, battling with sail, oars and a reticent outboard motor, he meets a wide variety of London characters, from old sea salts to curious hoodies. He pitches his tent where he can, not an easy task in a metropolis like London, and rises to the rumble of early morning commuter trains. When he finally completes his journey he emails the boat’s owner to warn him of damage caused during the dingy’s bumpy journey. The owner replies with six succinct words, “Don’t worry, boats are for using.” True words indeed. Canoe London was able to offer two copies of this great new book to give away. The competition ended on 15th August 2012. Congratulations to our two winners, Jacqueline Brown and Mark Kinsella! Circle Line: Around London in a Small Boat is available from Amazon. Published by Summersdale (Paperback, £8.99).